Featured Song "In My Frog Suit"
"Mush-Rumors" is the seventeenth episode of The Adventures of Super Mario Bros. 3; it aired alongside another episode of The Adventures of Super Mario Bros. 3 entitled "The Ugly Mermaid". In Kansas, a family of four is currently in the midst of driving the United States of America countryside to Wild Waldo's One-of-a-Kind Amusement Park in a station wagon. After the daughter of the family, Missy, continues to pester her father, Norman, about whether they are at the amusement park yet, Norman, flustered, stops the car; then sarcastically says they are here and to be quiet. Norman starts to drive again, only to be asked by his son, Bud, whether or not they are lost or not, to which Norman responds to with a somewhat hesitant no. As Norman continues to drive along, his wife tells Bud and Missy that the amusement park is still far away and to simply enjoy the scenery, as it will take them at least another hour of driving to arrive. After this is said, Norman drives the station wagon through a tunnel, which is actually a Warp Zone. The family in Mushroom Kingdom. Once the Warp Zone is driven through, the family find themselves in the Mushroom Kingdom; as Bud and Missy look around, bewildered, at their new surroundings, their mother calms them down and assures them that Norman, who believes he has somehow entered Iowa, will find a gas station and ask for directions. After his wife tells Bud and Missy this though, Norman, distracted by all the new scenery, accidentally crashes the car into a wall of Blocks. As the car's engine begins to steam, the family is left to panic as Norman, who has lost control of the car, tries desperately to steer it. As the car swerves out of control, it narrowly avoids hitting a nearby Mushroom boy who was fishing by a river; fortunately, the Mushroomer jumps into the river to avoid the car, which he perceives to be a monster. Eventually, the car begins to slow down and eventually crashes into another wall of blocks near the river before stopping completely. With the car having finally stopped, Norman gets out of it to inspect the engine of it. Opening the hood of the car, Norman is shrouded by a large amount of smoke and begins to cough, which frightens the nearby Mushroomer from before who, after being seen and yelled to by Norman, runs away frantically, claiming that aliens have come. Elsewhere, Hip and Hop Koopa are in the process of setting up a prank, placing a mirror in front of a wall to make it appear as if there is an opening in the wall. As Hop steadies the mirror though, Hip begins to wonder if the prank will work, thinking if there is anybody dumb enough to fall for it. Directly after Hip says this, the Mushroom boy suddenly runs directly into the wall and falls to the ground, dazed as Hip and Hop praise themselves on having pulled another successful prank. The Mushroomer screaming aliens to the Koopaling twins. Recovering from running into the wall, the Mushroomer proceeds to tell the nearby Hip and Hop to run, saying something about fire belching with four eyes; the Mushroom boy's ramblings cause a somewhat nervous Hip and Hop to ask what he is talking about, getting the response from the Mushroomer that horrible aliens are coming. This revelation about aliens causes a scared Hip and Hop to frantically run away, screaming. At Castle Koopa, Hip and Hop, still screaming and claiming that something is coming, are knocked backwards by Bully, who asks them who is coming. Hip and Hop proceed to tell Bully about the aliens, which is enough to even terrify Bully, prompting him to tell Kooky about them, who tells Big Mouth about them, who tells Kootie Pie about them, with the Koopalings' stories becoming more and more exaggerated. After being told of the aliens by Big Mouth, Kootie Pie runs to King Koopa's throne room, where she tells her father that zillions of heavily armed, fire spewing aliens are going to attack the castle before breaking down into tears, screaming that they are all doomed and that she does not have anything to wear. As Kootie Pie sobs in front of him, a shocked Koopa proclaims that he will have to attack the aliens, before they get to him. 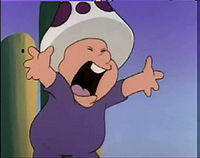 In the Mushroom Kingdom, the Mushroom boy is still in the midst of yelling that aliens are coming, causing anyone nearby him to instantly panic and make several, somewhat futile, attempts to hide. After being alerted to about the aliens, two Mushroom women, in a panic, accidentally jump into one another and are knocked to the ground. 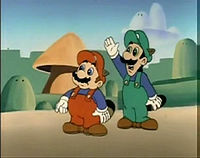 As a crowd gathers near the two fallen Mushroomers, Mario and Luigi appear and help the two to their feet, asking if anyone has actually seen any of these aliens. One of the Mushroom ladies responds she hasn't actually seen the aliens, but tells Mario and Luigi that she was told about them by someone else, which makes Mario question the credibility of the Mushroomers' alien story. Mario concluding that the "aliens" are real worlders. As Mario has his doubts about this story, he asks if anyone actually saw these "aliens". The Mushroom boy claims he did, and Mario asks to please describe what was seen. 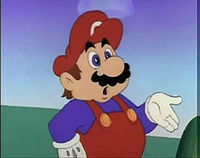 After the Mushroom boy tells Mario and Luigi about the aliens, Mario surmises that what the boy saw were real worlders, like him and Luigi, though the Mushroom boy still claims that what he saw were aliens. After the boy says this, Mario tells Luigi that they had better do an investigation on what is really going on. Up above, Koopa's Doom Ship suddenly materializes and floats through the air. Onboard the Doom Ship, Koopa is instructing Kooky to, when the "aliens" are seen, blast them with all the artillery the Doom Ship has. As Kooky says that no aliens are going to conquer their kingdom, Koopa tells Kooky he cares more about survival than the kingdom. Mario and Luigi inspecting the car. At the river, Missy is asking Norman if he has discovered where they are yet, to which Norman says no to, having discovered they aren't in Iowa, but that they might be in Nebraska. 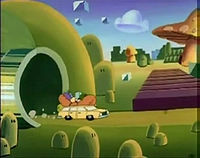 As Norman fidgets with his map, Mario and Luigi climb a hill and see the family's station wagon, at the sight of which, Mario tells Luigi that he was right, the aliens are nothing more then humans. As Mario tells Luigi this though, Luigi tells Mario to look upward, since Koopa's Doom Ship has suddenly appeared. Drawing near, the Doom Ship begins trying to blast the station wagon with Bullet Bills, while several Rocky Wrenches on-board it throw their wrenches. Luckily, the Doom Ship's assault fails miserably, with the Bullet Bills missing the station wagon and becoming lodged in the ground while the thrown wrenches fall into the river. Noticing the rain of objects falling towards him, Norman begins to yell upwards at the Doom Ship as Mario and Luigi rush to his car. 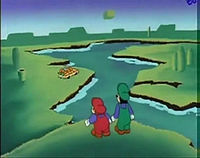 Dodging the munitions launched from the Doom Ship, Mario and Luigi manage to pull the inflatable raft off the car and into the river, before pushing the station wagon itself on to the raft. As the car begins to float away, Mario and Luigi jump on to it, just as the Doom Ship begins to drop Bob-ombs downwards. Bully explaining to Kootie that the aliens are tricking them. Up on the Doom ship, Koopa, Bully, Kootie Pie and Cheatsy Koopa are all overseeing the attack on the station wagon. 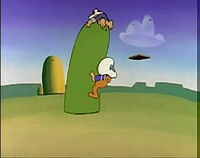 Suddenly, Bully notices Mario and Luigi riding the top of the car, while Kootie Pie also notices that the aliens they are attacking look like humans. After Kootie Pie and Bully mention these oddities to Koopa, he assumes that the evil aliens have taken on a human form to trick Mario and Luigi into helping them and also orders that Chain Chomps will be launched from the Doom Ship. At Koopa's command, four Chain Chomps are launched from the cannons of the Doom Ship and are sent plummeting downwards into the river below. Landing at the bottom of the river, the Chain Chomps stretch upwards and deflate the raft the station wagon is on with their teeth, causing it to slowly deflate and sink. As the raft begins to go underwater, the Chain Chomps grab its tires in their mouths and begin to tug it underwater quicker. 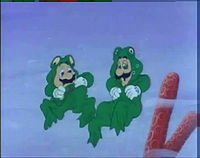 Mario and Luigi dressing in Frog Suits. As the family roll up the windows of the car, Mario and Luigi slide off it and fall into the water. Swimming through the river, both Mario and Luigi see a treasure chest; and as Mario rummages through the chest, throwing away several useless objects, Luigi alerts him to an approaching Scattering Bloober and her swarm of Bloober babies. Eventually finding a pair of Frog Suits in the chest, Mario and Luigi put them on and begin to swim away from the Scattering Bloober, Bloober babies and a recently appeared Jelectro. As they swim, Mario and Luigi manage to defeat these sea creatures by tricking them into crashing into things, such as a stone wall and each other. After defeating two Bloober babies, Mario swims to the surface and after hitting a few Jump Blocks, finds a Starman, which Mario grabs and turns invincible with. 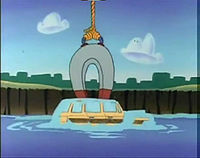 Going back underwater, Mario grabs the Chain Chomps and tears them off the tires of the station wagon and throws them away, allowing the station wagon to float back to the surface. The magnet grabbing the car. Unfortunately, the station wagon is grabbed by a large magnet lowered by the Doom Ship, which begins to tow the car and the family inside, to Castle Koopa, leaving both Mario and Luigi to watch them go in shock. 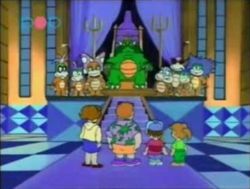 At Castle Koopa, King Koopa and the Koopalings are beginning an interrogation of the confused family. Koopa demands that the family change to their true forms, horrific alien monstrosities, which only confuses the family more and prompts Norman to begin trying to question and threaten Koopa. 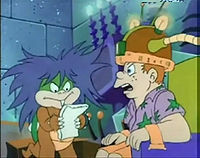 Kootie Pie, becoming annoyed, tells Koopa that the aliens are still trying trick them by staying in human form; Kooky reassures Kootie Pie and Bowser though, saying that he can get all the information needed from the family by using his new Transmutational Brainwave Analyzer, which can scan the families' minds and reveal their plans of conquest, which can then be used by Koopa to conquer the Mushroom Kingdom; the magnitude of Kooky's actually causes Koopa to cry tears of joy at how proud he is of him. In his lab, Kooky has hooked the family to bizarre helmets which are connected to a machine, which deposits a paper which Kooky grabs. As Kooky begins to look at the paper, Norman, somewhat hysterical, demands answers and that he and his family be set free. As Norman continues to yell at Kooky, a nearby wall is blasted apart by Mario and Luigi, who have donned Raccoon Suits. As Mario tells Luigi to turn-off Kooky's Transmutational Brainwave Analyzer, Mario begins to free the family from the restraints keeping them in place. After Luigi finishes kicking several levers on the Transmutational Brainwave Analyzer, Mario tells Norman and his family to follow him to their car, which was left on. Luigi telling the family to have a safe trip. At the Warp Zone tunnel, Mario and Luigi tell Norman to just keep driving straight ahead and he and his family should be back in the real world. Thanking Mario and Luigi for all their help and asking them to come see them if they ever come to Wichita, the family leaves through the Warp Zone. The Mushroom boy from before, having seen them leave, begins to run and yell to everyone nearby that the "aliens" have left. At Castle Koopa, Koopa is telling the Koopalings that it does not matter if the aliens are gone and says that Kooky got all their plans. Kooky, somewhat embarrassed, tells him that the aliens weren't actually aliens; they were just humans who were traveling to Wild Waldo’s One-of-a-Kind Amusement Park. This revelation causes Koopa to angrily shout who caused this alien panic in the first place. The Koopalings, not wanting to get blamed, proceed to point to one another and yell "He did! ", which causes Koopa to slap himself in the face in frustration. In Kansas, Norman and his family are driving down a road when Missy quickly asks Norman "Are we there yet? ", which causes Norman to slap his own face in frustration as well. The young Mushroomer is wearing purple overals with a lilac shirt. When he falls in the water, the shirt turns completely purple. When he spies the family from behind a hill, he has no sleeves and his shirt turns lilac. When he asks for help, the overalls and the shirt turn into an only piece of clothing colored purple. When Hip says "But is anybody dumb enough to fall for a prank like this?" his mouth does not move during the last two words. When Hop asks the Mushroomer what he's talking about, he pauses before continuing in Hip's voice. At the same time, Hip moves as if he was going to talk. Oddly, Koopa refers to Kooky as Kootie Pie when inquiring how he can learn the secrets of the aliens. Cheatsy's head and hair color continues to shift in color throughout "Mush-Rumors". When Kooky is telling his rather exaggerated story about aliens to Big Mouth, his head is not connected to his body. When the family are in the Mushroom Kingdom, Bud says "This is cool", the background is the Mushroom Kingdom. However when Missy says "This is freaky", the background is the real world countryside. When Hip is saying the last parts in their sentence as he and Hop warn Bully about the incoming "aliens", he opens his mouth but Hop says it. When Kootie Pie is alerting King Koopa about the "aliens", her wristbands become yellow spiked and black, as well regular to the other Koopalings' ones. Norman's vacation shirt continuously swaps from yellow to purple throughout the episode. When the Mario Bros. help up two Mushroomers that had fallen down, Mario's mustache is black. When Luigi asks if anyone had seen the aliens, Mario's mustache is brown. After that, it turns black again. Although the Mushroom woman with the purse claims that the lanky Mushroom man told her about the incoming aliens, it was really a young Mushroom boy who alerted everyone about the aliens, with the woman hearing the advice from the boy, not the latter citizen. Every time the screen switches between Mario and Luigi to the crowd of Mushroom citizens, the crowd appears to be diminishing. When Kootie Pie runs to King Koopa, she has no shoes. This also happens when she says "All right, aliens, you can't fool us!" and again when she says "Dadakins". The paintings of King Koopa's family have different colors as opposed to the Koopalings normal color scheme. When Hip and Hop are telling Bully about the aliens, Hop's eyelid is slanted. When Mario comments "It sounds like you Mushroomers are spreading Mush-rumors", the "M" on his cap is white with a red background, blending in with his red cap. When the Mushroom boy emerges from the crowd, his hat is much larger in size than normal, but it quickly reverts back to normal size when the screen zooms in. As the four Chain Chomps sink to the bottom of the river to ambush the station wagon, the Chain Chomp in the back-right appears to be "dead", as it is not moving. Norman: "We're sure not in Kansas anymore." Mario: "Sounds like you Mushroomers are spreading mush-rumors." Italian Aiuto! Gli alieni! Help! Aliens! Princess Toadstool and Toad do not appear in this episode. The name "Mush-Rumors" appears to be a pun on the term Mushroomers. This is even referenced to in the episode, when Mario, doubtful of the stories of aliens, says "Sounds like you Mushroomers are spreading mush-rumors." 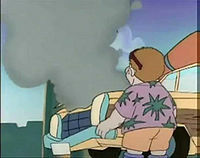 When Norman drives into the Mushroom Kingdom, he remarks "We're sure not in Kansas anymore", which is a reference to a similar quote from The Wizard of Oz. When Hip and Hop put a mirror in the wall, the checkered ground reflection is a continuation of the real floor. 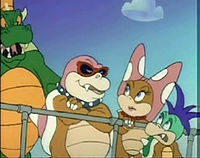 A family of three bearing a strong resemblance to Norman's without Missy can be seen in the Super Mario World episode Rock TV. Koopa spies on them watching Wheel of Fortune in a flashback. ↑ May 20, 2015. "Mush-Rumors", dubbed in Romanian by KidsCo. Odnoklassniki (OK.ru). Retrieved January 4, 2016. This page was last edited on March 27, 2019, at 18:23.